Ava Bonam visits various countries, cultures, languages and times in her 2018 project MY YEAR IN FOLK SONGS. Myth and folkore has always been one of the most influential figures within the arts. Traditional folk songs are meant to be accessible, their melodies are memorable and the lyrics portray perfectly the age and region they were once composed. Many of these songs travelled far, the lyrics changed from region to region, sometimes even from vale to vale. As most of Bonam's work speaks of the beauty of folklore and literature, it came naturally to revive some of these traditional folk songs. The project was intended to last until the end of 2018, but was quite inspiring - there it will continue. The full moon symbolises the great stillness of the night in this German folk song, written (as a poem) by Matthias Claudius in the 1770s and set to music by Johann Schulz in 1790. It speaks of the shift in perception when the light of the moon illuminates the forests and the ascending mist cloaks the night. This version begins choral and traditional, but changes its melody and instrumentation from the second verse on. Instruments used: voice, piano, harp, kalimba, clarinet. Parley, sage, rosemary and thyme. Or: Every rose grows merry with time. Or: Yesterday holds memories in time. You will find various versions of Scarborough Fair. The melody is in the Dorian mode, which was typical for the middle English period. And it was quite popular, so it spread and changed and had a life of its own. It is a battle of former lover's who ask each other to perform quite impossible tasks - only then "you'll be a true love of mine". This version is solely choral. In the end you'll hear 13 different voices. A little girl who lives merrily in the forest. The 'norsk folkevise', the traditional Norwegian folk song "Eg veit ei lita jente" (I know a little Maiden) is best known as a nursery rhyme. This version is a live recording and darker in tone than the original, brought about by the lovely sounds of the kalimba. Катюша (Katyusha) is the diminutive form of Katherine - and the name of a Soviet rocket launcher used during World War II. Pondering thus, the lyrics are rather ambiguous. The beautiful melody is composed by Matwei Blatter and the lyrics were written by Michail Issakowski in 1938. The song is about a girl yearning for her truelove who serves as a soldier faraway. She sings a song and hopes that the wind and the sun and the birds will carry it to him, so he remembers her and her love for him. With the outbreak of World War II, the song got very popular in the Soviet Republic due to its topicality. The melody spread even further: Italy, France, Spain, GDR and Finland. There's is also an English version sung by Nat King Cole. Sakura means cherry blossoms and is a traditional Japanese folk song that originates in the Edo period in the 17th century. The melody and the lyrics were finalised in the Meiji period at the end of the 19th century when the song was very popular. Nowadays it is often sung in international settings, musically representing Japan. It depicts spring, the season of cherry blossoms and due to its rather modest range of melody the song could be played by many instruments with limited pitch. No, I regret nothing. This confident statement was sung in many languages and by many people, but Édith Piaf's recording in 1960 is the original and the best known. Composed by Charles Dumont and written by Michel Vaucaire in 1956, the chanson became a big success for Édith Piaf who was by then already struggling with cancer. "Balayé pour toujours, je repars à zéro"
"Flowers, flowers (Ciuri, ciuri) all year long" - you can have that in Sicily. The Sicilian folk song Ciuri Ciuri was written by Francesco Paolo Frontini in 1883. It's about the highs and lows in a partnership: You might have the most wonderful time with you partner, but also the most awful. When I visited Sicily earlier this year, I was amazed by the richness of colours near the Mediterranean Sea, and by the vastness of rocks on Mount Etna, a (very) active volcano. I found that some of the footage I filmed during my stay there quite perfectly fit the contrasting feelings one might have from time to time when being in a relationship. 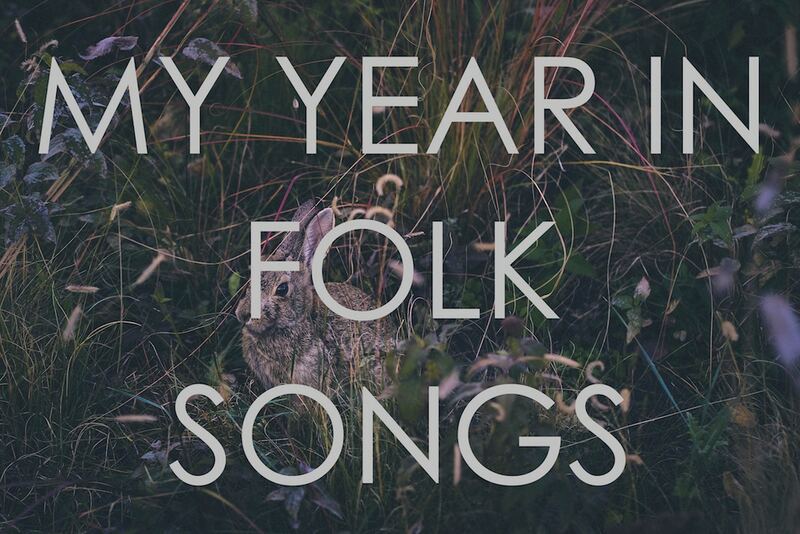 The playlist of all the MY YEAR IN FOLK SONGS pieces.